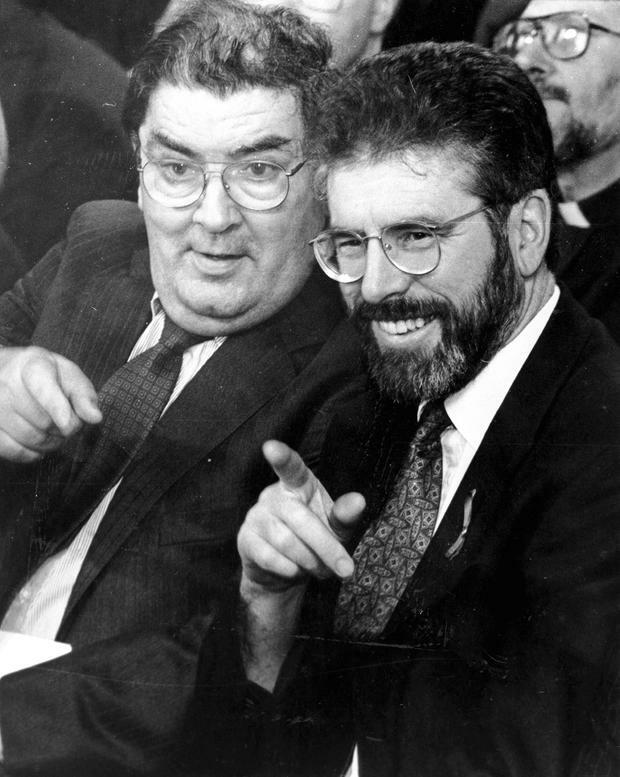 NON-VIOLENT STRATEGY: The objective of the dialogue between John Hume (left) and Gerry Adams was to end IRA violence. The Sinn Fein presidential candidate selection process will continue to feature in the news during the holiday period. Sinn Fein’s would-be Uachtaran will subsequently provide a stockpile of Sinn Fein PR to convert into votes during the next general election here, where Sinn Fein is rising to prominence considerably. Sinn Fein realises that there will very likely be significant shifts in the political structures of Ireland as the Brexit chaos proceeds. It would be unconscionable for Sinn Fein to miss the opportunity to exercise its potential, unique among Irish political parties, to be in government on both sides of the border when those structures are negotiated. In the North, while Sinn Fein and the DUP are both remiss in refusing to implement the central provision of the Good Friday Agreement, Sinn Fein may yet see the benefits of pushing for a deal when Stormont talks resume. In the South, Sinn Fein’s fervid desire is to migrate from the opposition benches in Dail Eireann, where it has languished for nearly two decades, and become a coalition partner in Government. For Sinn Fein, then, manoeuvrings to get into government exceed all other concerns. Nevertheless self-examination on the part of Sinn Fein of its suitability to accomplish the New Ireland that today is its mantra would serve the party well. Sinn Fein’s credibility as a broker of a New Ireland depends on its ability to break with its past in an authentic and convincing manner. That entails a public denunciation of the IRA’s violence (1969-1994) as a futile terror campaign. This would enable Sinn Fein to publicly renounce, immediately and without prompting, the actions of anyone in its organisation who humiliates people of both the unionist or nationalist traditions by glorifying the violence perpetuated by the IRA during the Troubles. This leads to the final move required of Sinn Fein, an outgrowth of the above: it must stop attempting to rewrite recent Irish history. Please sign in or register with Independent.ie for free access to Opinions.